When we were kids, Ma and Pa would always bring us to Baguio every summer. While they're mingling with fellow pastors and church workers, me and my siblings are busy rolling in the grass or playing hide and seek in the giant pine trees. Sometimes, we're with older cousins so they bring us to town and accompany us boating or running along the Burnham Park. Those memories were ages ago. Hahaha. The last time the whole family's there was before I entered high school. After that, because bus fares are rising and we're becoming matakaw, Ma and Pa would leave us at home and do our endless movie marathons nalang. Hahaha. 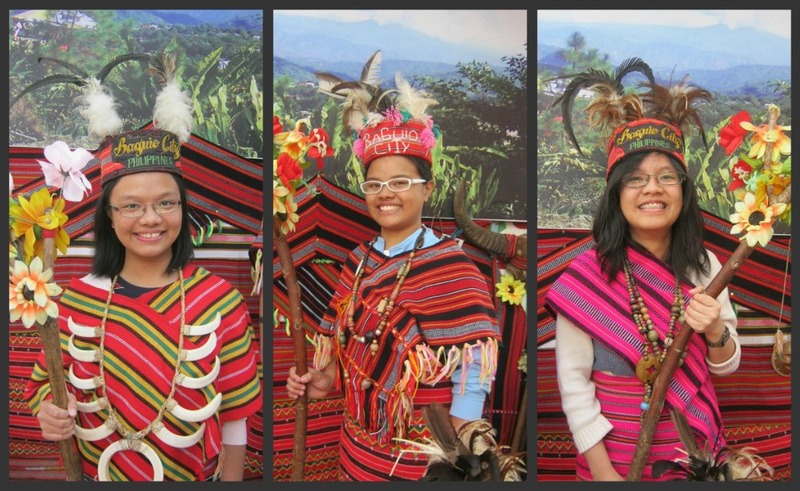 We missed Baguio soooo much. I mean, it's part of our colorful childhood. Hahaha. Anyways, when we learned that my sister, Nik would be studying there, we're happy! Well, we're also sad cos she's gonna be home only on semestral and summer breaks but we're also happy because we'll get the chance to stay there if we want too. She's got a big room in her dorm so she can let us have our vacation there. Yay! It took us a while before we finally decided to have a little vacation at her dorm. Usually, she would go home and spend her long weekends with us. She doesn't fail to bring us some goodies from up there like chocolate crinkles, strawberries, peanut brittle and tons of bagsak-presyong gulay. So we thought, kami naman ang aakyat. Me, Tel and Bet with our cousin Ate Margie and his cute five year old son, Josh were all set to go to Baguio. Yay! Ephra wasn't able to come because he has a competition in Tagum City. Ma and Pa allowed us to go on our own. Cool! We weren't able to catch the 11pm bus ride at Genesis so we waited for the 1am land trip but we also failed to make it because of the very long queue. The bus manager told us that the next trip would be by 2am but God's really good because after 30 minutes another bus came in and allowed passengers to get in. Fast forward. We arrived at Baguio by 8am. We missed the Street Dance Parade because we were too famished to go to the streets and watch the flower-costumed students dance. It could have been a nice experience. After a few hours of rest and lunch, we decided to go to Mines View Park because Josh wants to see the wishing well there (his funny wish: become a Monster Galaxy and fly. hahaha). We never expected A LOT of people to be in Baguio. As in ang dame talaga! Because we can't squeeze our bodies to go to the actual viewing deck at Mines View, my siblings and I just decided to take a lot of pictures. Then we went out. There were also no taxis available so we decided to walk down the road “less traveled” (hahaha) until we found an empty one. 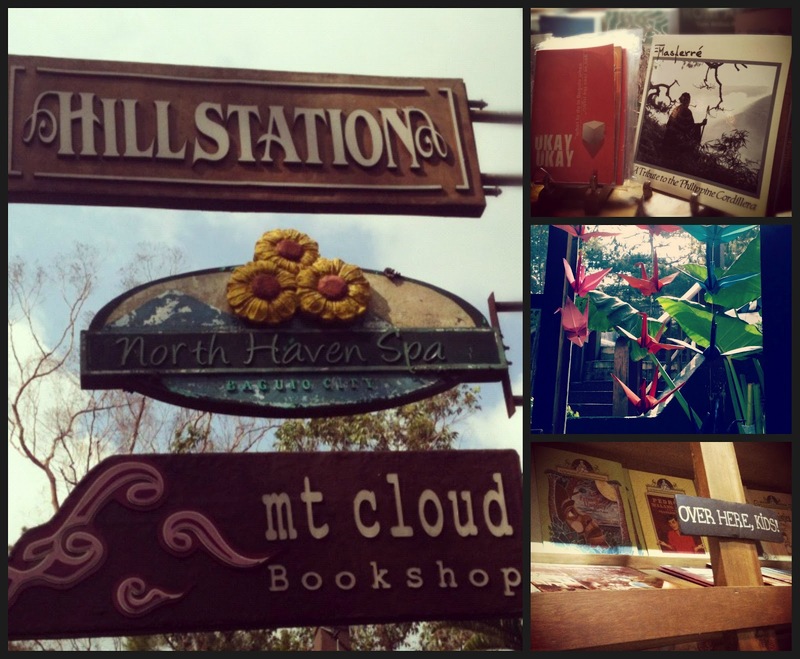 We visited Mount Cloud Bookshop—one would love the dreamy ambience inside that shop. The wooden bookcases and stairs and even the piped-in music complements the past-era feel. I haven’t got the chance to chat with the shop owner (I’m a bit shy. Hahaha), so we just flipped through the books. I actually smelled them. Hahaha. I love that musty scent of bookpaper. Hahaha. May saltik lang. Anyways, beside Mount Cloud is a cute café called Hill Station. We could have stopped by to eat dessert kaso mejo high end so next time nalang. Hahaha. Oh before I forget, the path we went through just to get to Mount Cloud was the ever famous Barrio Fiesta Stairs with Life- Size Figures—from native Igorots to Philippine icons like FVR, GMA, Cory and Cardinal Sin. Cute lang. Hahaha. 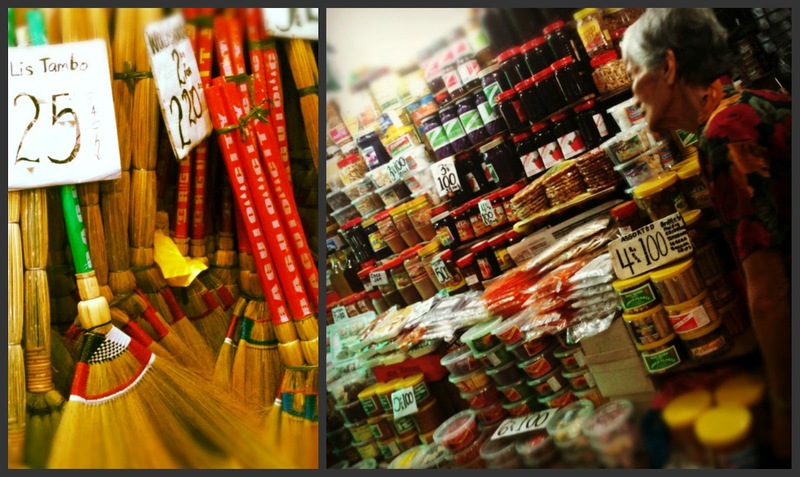 We capped the day by going to the public market to buy pasalubongs. We bought the usual: strawberry, blueberry and ube jams, peanut brittles, lengua de gatos and strawberry-flavored pastillas. My cousin also bought walis. Then my sister accompanied us to the bagsakan area. Ang galing lang. For ten pesos, one would have a kilo of baby potatoes. 15 pesos naman yung large potatoes. Broccolis are sold 30pesos per kilo. Other veggies like carrots, lettuce, Baguio beans and bean sprouts cost cheap. Baguio serves as one of the commercial hubs in the north before they’re finally shipped to Manila or other downtown provinces, hence the cheap prices for these raw products. We also bought knitted sahals from Sagada and ground coffee beans. They have different flavors and variants: Benguet, Arabica, Hazelnut, Barako and even Alamid, the one that comes from the poop of Philippine civets. On the average, the ground beans are sold for 200 per kilogram. Alamid, on the other hand, is priced at 1,200 pesos per fifty grams. I so want to try it kaso sobrang mahal, e grepa me so next time nalang ulet. Hahaha. When we got home, we’re all dog-tired so nagkatamaran na bumalik ng ukayan. We decided to eat early and sleep early too. While waiting for food, we watched the first half of Hugo. By 9pm, everybody’s already snoring. Zzzzzz. We all got up early so we can get a nice place to watch the Flower Float Parade. My sister told us it would start by 8am but when we got there, wala pa, so we went to Burnham Park first. Because of insistent public demand (si Josh lang naman), we tried boating. He chose the dolphin-designed boat. By the time we got in the middle of the lake, he told us he’s already feeling seasick. Sabe ni Tetel, he can’t be seasick cos we’re on a lake. Hahaha. Everybody just laughed. Hahaha. The bangkero’s also astig tulad ni Kuya Jun sa Laoag Sand Dunes 4WD. We thought he’s an ordinary bangkero—he told us that the Burnham Lagoon is actually an extended lake. There are fishes there—carps, tilapia and janitor fish. Then he told us that there are springs from underneath the lake. Hmmm, ok yung mga trivia ni Kuya sabe ko. And then he started talking about the microbes found in water and that Baguio’s situated under a dead volcano. That’s the reason why there are springs underneath—hot springs pa daw. Wow lang. I finally found the courage to ask, “Kuya, nagbabangka po talaga kayo or hobbyist?” He told us he’s a former professor at the University of Baguio. Ahhhh. He already made a lot of studies about IPs and other interesting things here at the Cordilleras. Ahhhh. And because he’s friends with the owner of the boats, he makes boating his daily exercise. Ahhhhh. Ikaw na talaga, Kuya. You already. 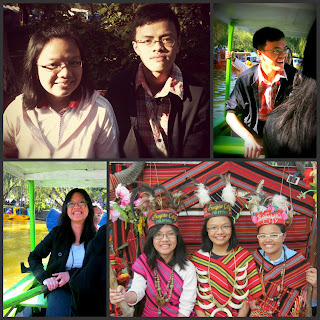 After our boating, we already wound our way towards the streets of Baguio to watch. We left Ate Margie behind because she has to feed the fat Josh. Haha. Ok. So there we are in a sea of people waiting for the floats to come out. At last! The Mayor and other officials began the parade. All I can say was “Wow!” There’s an Angry Birds’ themed one, then the SM float was a dragon with a fuming nose. The best one for me was the Star Wars float complete with OB1s and Yoda (wasn't able to get a nice picture tho'). Hahaha. 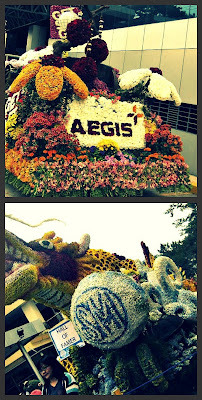 There were also floats from establishments in the city like Mang Inasal, Aegis People Support, Nestea and Nestle. 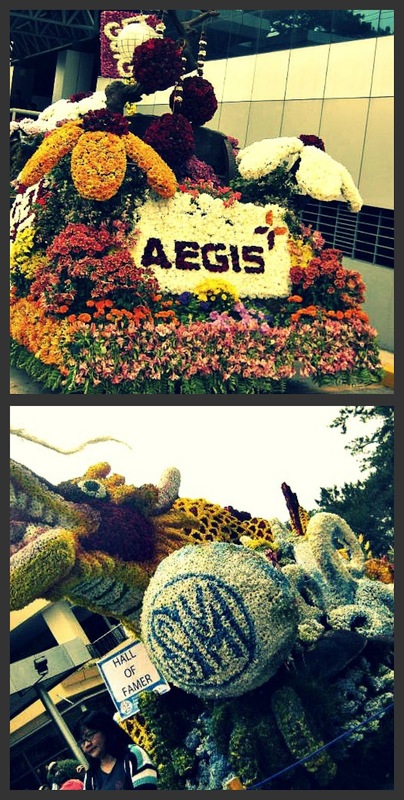 Television networks like TV5, ABS-CBN and GMA7 also adorned their floats with thousands of flowers. Of course, their biggest stars are also there to grace the event. TV5 has Amy Perez (everybody’s shouting “Face to face!”), Tuesday Vargas, Nina Jose and Valenzuela Councilor Shalani Soledad- Romulo (“Family Apir! Putukan Naaaaa!”). Hahahaha. GMA7 brought in Marian Rivera and Dingdong Dantes. The float with most fans, I guess, was ABS-CBN’s. They’ve got the Showtime gang in there—Kuya Kim and his infamous cowboy hat (I think he should patent that), Ryan Bang, Jugs and Teddy, Jhong Sample and Vice Ganda. Miss Earth Philippines’ winners were also there. By 11am, the parade officially ended and everyone’s like soooooooooooo gutom. We initially planned eating at 50s Diner but we ended up at Vizco’s. So much for hunger. After filling our grumbling tum-tums (Yap, eternity), we headed to the public market again, this time for ukay time. Dameng choices kaso the remaining moolah we have is for our bus fare so yun, wag nalang. 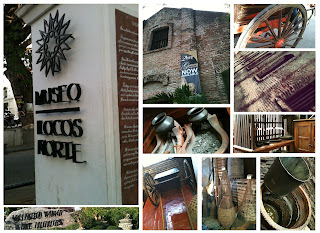 I have fallen in love with Laoag the first time I went there six years ago. We had to finish a webmagazine for an international competition sponsored by the SEAMEO- RELC. To be honest, I wasn’t much giddy to begin with because going there by land means 12 loooong hours sitting inside the bus plus I have motion sickness so anytime I feel nauseous, I’ll throw up. Yuck. But anyway, when we got there, I thought it was one of the places to be. This year, because of work, I had to go back to Laoag but this time, we’re going to use the office van so it’s more comfortable plus I was able to overcome my motion sickness, so I’m good to go. Hahaha. By 4pm, our team left Manila. In prep for one long, arduous land travel, I had my phone fully charged and my playlists updated so I won’t be bored. Well, it turned out, I won’t need my playlist sa dame ng kwento ni Ate Fina at Ate Ann. Plus, we’re too addicted with Temple Run *game face on*. Hahaha. By the time the sun set and we’re still on the road, everyone’s asleep except Ate Fins who kept Kuya Ariel company. She’s singing Whitney songs, by the way. What a tribute, I say. Hahaha. Around 10pm, we stopped over Urdaneta City for a late dinner—Matutina’s! Yey. Food’s great—we had sisig and bangus belly plus rice overload. Then we’re off the road again. Fast forward. At exactly 4am we arrived at Java Hotel in Laoag City. I thought we’re just getting some gas for the car, yun pala yung front talaga ng hotel. Fail. Hahaha. After checking in, we went ahead to our rooms and got ourselves some sleep. I even set an alarm ng 7am so we could eat breakfast but we failed to wake up. It’s already 10am when we got out of our beds and everyone’s preparing to head off lunch at the City Hall. Hahaha. Anyways, we helped ourselves to some nice lunch and then went on with the coordination meetings with Mayor Mike. After that, we went back to Java to get our stuff because we had to transfer to another hotel to give way to the mayors coming for the meeting. Then, free time! Ate Fely and Ate Joy went to the market, Ate Fina took a nap and Ate Ann and I explored the streets of Laoag. We decided to ditch the tryke and allowed our feet to take us where it wants us to go. Hahaha. Our feet did not fail us, we found ourselves in front of the Provincial Capitol counting fountains and then we glanced inside the Pamulinawen Trade Fair. We also explored the city plaza where they hold concerts and other city activities. 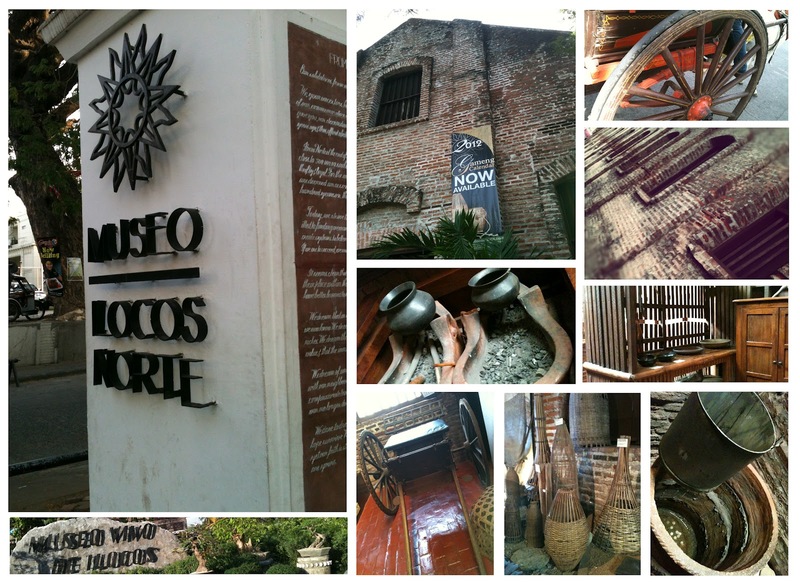 Finally, while looking for a place to eat, we found the Museo Ilocos Norte, a bricked building just beside the Provincial Capitol. Unfortunately, we weren’t able to go inside because it’s already closed. 5pm na kase. Hahaha. Oh, we also stopped by to admire the beauty of the Laoag Sinking Bell Tower. 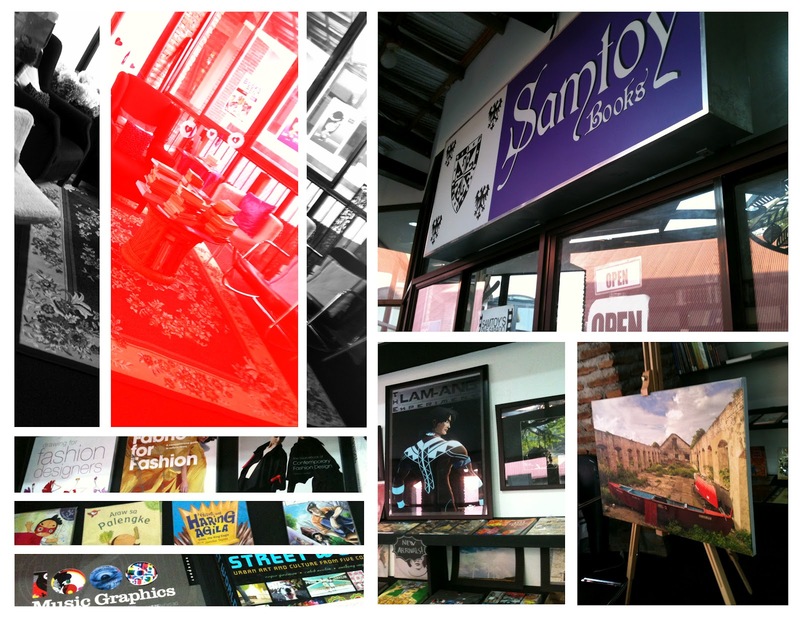 Luckily, we found a bookstore called Samtoy beside it too. We went inside to take a peak and wow, it is a very nice bookshop! We looked into their collection and I was just like, wow. I even sat down the floor to flick through several titles and tomes. They have books from UP Printing Press, ADMU Press and other cool titles I don’t usually get to see in “mainstream” bookstores. They even have a reading area where one can rent a book for 5 pesos per hour. 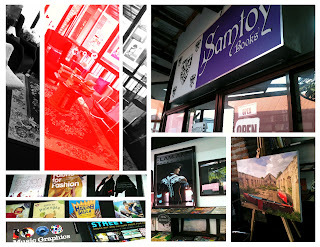 The saleslady, a friendly, geeky girl invited us to their Sine Sabado, one of their store’s activities. She was speaking to us in Ilocano and we’re like black faced. And then she realized we’re “dayo” so she spoke in Tagalog. I forgot the movie they’ll screen but I remember telling her, “Sayang, kaso po pabalik na po kami nun ng Manila.” Well, saying talaga. Mukha pa namang maganda yung movie. Anyway’s Ate (I wasn’t able to ask her name) recommended that I buy UP Press’ Ultraviolins—it was a collection of short stories and poems translated in Tagalog by up and coming writers like Lourd de Veyra. Cool. I bought the book for only 250 pesos. I thought it was a good find since I wasn’t able to see it in local bookstands. Ate Ann bought a Freud book for 200 din ata. We learned that Ate saleslady was a LegMa grad from USTe—sabe nya kase she thought she knew Ate Ann—classmates pala sila on one class whatever. Small world, I say. Stomach rumbled. Grrrrrowl. Hahaha. We went down the stairs and found Johnny Moon Café which serves local favorites like the famous Ilocano Empanada. Since it’s already 5.30pm and we have to get back to the City Hall for dinner ng 6.30pm, we just ordered something for takeout. 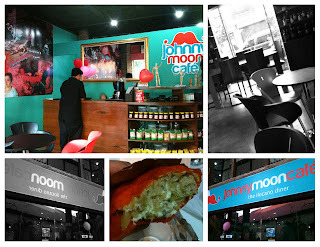 I had the Special Longganisa Empanada and Ate Ann had Tupig con Chocolate. We ordered Special Bagnet Empanada for Ate Fina because we’re kind friends. HAHAHA. Then we saw they have ice cream cups so I bought for the three of us. I had papaya and Ate Ann chose Saniata or Dragon Fruit flavor for them ni Ate Fina. We walked the streets of Laoag again on our way to the hotel. We ate our takeouts inside the room—the empanada’s a winner. And also the ice creams. Yum yum! The next day, the mayors and other guests were toured around Ilocos Norte. Since we have to facilitate the preparations for tomorrow’s meeting, we’re left at Java. But that doesn’t mean we’re losers. We went back to the museum and had tons of concept pictures. Then we also rode the calesa because, why not. Haha, fun ride that is. Horses enjoy the King of the Road status in Laoag—motorists are banned from beeping when calesas are ahead of them because they’ll get startled and might run amok so they had to slow down. Astig! When we arrived at the hotel, we tried biking but the bike’s too high for a “petite” girl like me so after 30 minutes we went wall climbing. I never thought it’s an easy feat but I guess I have to try for my Bucket List. Yun. Ate Ann passed because she’s wearing a dress so ako nalang and Ate Fina. She went ahead because she was able to try it before. Cool! She was able to reach the top part. On my part, I wasn’t able to do so. While climbing, I have to exert every effort to carry my body to reach the next stone. I tried my best to get on the top stone but my arms are already aching I had to rappel down. We tried for a second round and I still wasn’t able to reach it. Ambigat ko talaga. Hahaha. Because of that, I plan to lose weight. Hahaha. Dinner that night was sponsored by Ilocos Norte Governor Imee Marcos at the Malacanang of the North. Again, as part of our duty to facilitate the whole event, the three of us went ahead to the venue with some staff from the city hall. That was a good thing din because we had the chance to see the sunset at the Paoay Lake plus we toured ourselves inside the mansion. Tons of concept pictures nanaman. Also, we had the chance to shake hands with Gov Imee and listen to her speak. Galing lang. Haha. Whole Day Meeting. Blast by the Evening. Friday’s meeting day so no adventure stories for that. I just sat down and took the minutes of the meeting. Hahaha. Dinner was at the City Hall again, it was some sort of a fellowship night. We watched in awe as the Laoag City Gymnasts danced acrobatic moves in front of us. They were last season’s grand winners of ABS-CBN’s Showtime. We’re equally entertained with the vocal prowess of the high school choir from Ilocos Norte National HS. Mayor Mike proudly told the audience they’ve won competitions internationally. I really loved their funky rendition of Lady Gaga’s Edge of Glory. Dub du pop pop. Dub du pop pop. A local band called The Edralins also gave their best covers of alternative rock anthems. They even had mayors singing onstage and the guests dancing merrily to Buttercup. Hahaha. The night’s a blast. A barren region is considered a bleak place to be in. Sun’s scorching hot and there’s no water everywhere. But, but, but. Ibahin ang La Paz Sand Dunes ng Laoag. The place boasts of a nice landscape perfect for “concept” desert photos. It is also a good place to do adventure-filled activities like sand sledding, sand boarding and off-roading. Kuya Jun Musni, the astig driver, told us that the sand activities in La Paz started out as a group hobby. Because they have these giant four-wheel drives, he and his friends started off-roading there. Then, the rest they say was history. Tourists and hobbyists started flocking in. Soon, they added sand boarding and sledding, patterned after those activities done in Dubai. An hour’s ride on the four-wheel drives plus sand boarding costs 2,500 for a group of four people. Not bad. Trivia: We learned that two foreign films: Mad Max and Born on the Fourth of July, have shot several scenes here. We’ll definitely go back. Promise. Yun lang. Nuff said. Hahaha. The Queen of Pop's sudden death cast a gloomy cloud over the whole music industry as well as the globe. Since I wasn't gifted with a golden voice as that of Whitney, I deem it a proper tribute to post here my Top 5 favorite songs of her. Naalala kong nakalagay pala sa Bucket List ko na dapat mapuntahan ko yung lahat ng lugar na nabanggit sa DOT Theme Song. Kaya yan, eto yung lyrics at dito ako magco-cross out. Hahaha! Subic, Baguio (I Shall Return, ika nga ni MacArthur) at Rice Terraces? Yun. Kung trip nyong jumoin sa mga escapades ko, feel free. I'd be glad to have a friend as company. Naks. Sana talaga makumpleto ko to.